Sony F5 vs FS7 - Which is Better? Both of these camcorders shoot 4K video, but which is the better buy? Find out the key differences between the Sony FS5 and the Sony FS7 by reading our handy guide. Both the Sony FS7 and the F5 use very similar Super 35 mm 4,096 x 2,160 CMOS sensors that deliver 8.8/8.9 effective megapixels respectively, so a score-draw here. The Sony FS7 uses the smaller, more versatile E-mount, while the Sony F5 uses the larger, more sturdy FZ mount which can also utilise PL lenses with the supplied adapter. The Sony FS7 is a prosumer camera on steroids with a streamlined, yet rugged design. Built with reliability and straightforward handling in mind, it’s operability is perfect for one-man usage. The Sony F5 is more of a stripped-down pro camera, offering a compact and flexible build that brings serious quality to a wider range of budgets. The Sony FS7 is dust-proof and splash-proof, while the Sony F5 is officially not, although it will probably survive reasonable expose to the elements. The Sony FS7 weighs in at just 2 kg, a couple of hundred grams lighter than the FS5, but it also uses smaller, lighter lenses. This means there's actually a 1-kg difference between them when the cameras are all set up and ready to shoot. The Sony FS7 can record footage in 12-bit RAW, while the Sony F5 can record footage in superior 16-bit RAW. So, if Raw output is paramount, the F5 is by far the better choice. The Sony FS7 has a super slow motion capability reaching 7.5x at cinematic 24 fps, while the Sony FS can record high speed 120fps footage. The Sony FS7 can autofocus (with face-tracking), while the Sony S5 can't, although this won't phase experienced videographers in the slightest. The Sony F5 has a very handy side display panel which allows you to quickly see how the camera is set up and change the day-to-day functions without interrupting the live image in the viewfinder. The Sony FS7 has two XQD media slots, while the F5 has two ExpressCard/34 slots and one SD card slot. 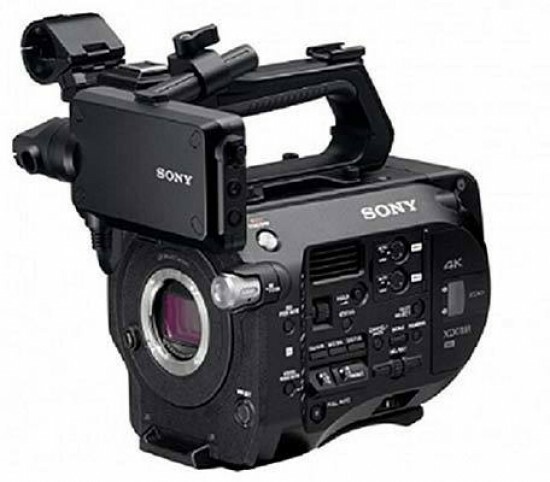 The Sony FS7 was released in September 2014 and the Sony F5 in October 2012, although Sony have released numerous firmware updates for the F5 to help keep it up to date. The Sony FS7 is several thousand pounds cheaper to buy than the Sony F5, in the UK at least, but the rental prices are actually very similar due to the difference in age between the two products. Therefore it probably makes sense to try both out for a short period of time before investing in one of them for the long-term. So there you have it. It’s definitely a very close-run thing between two very capable camcorders. We'd suggest that you rent both to try them out and see which one suits you, although if the best raw quality is at the top of your shopping list then the Sony F5 is the clear winner. You can hire both the Sony F5 and FS7 from Visual Impact, Europe’s leading supplier of broadcast equipment to the production community.